As a marketer, you probably spend your time working within a multitude of different digital spaces simultaneously: analytics tools, social media networks, emailing systems, and digital ad tools. No wonder you’ve always got 23 different tabs open in your browser and it takes you ages to create just one digital marketing report for your clients! Nowadays, businesses don’t really have a choice to be active on social media networks if they want to be successful. With algorithms changing everyday, it’s important to consistently track how your social media marketing efforts are faring. Facebook, Twitter, Instagram, LinkedIn… engagement, reach, impressions… knowing where to look can be a headache. Bring it all together in one clean, easy-to-read report! In the digital space, it’s all about traffic. SEO is the process of improving your web content to target the RIGHT audience and offer them exactly the information they’re looking for: in the right place, at the right time. A clear and concise SEO report is the best way to make sure your optimisation efforts are bringing you in the right direction. Following the trends in sessions, conversions, backlinks, and more, will help you make sure that you’re constantly improving your standing compared to your competitors. Sometimes, to get in front of the right audience efficiently and effectively, paid search marketing is the way to go. Whether you’re using AdWords, DoubleClick Campaign Manager, or paying for advertising on any combination of different networks, it’s important to visualize your strategy as a whole, instead of each network independently. With a centralized reporting tool, you can easily incorporate data from various platforms, analyze your results together, and optimize each channel as needed. A great digital marketing report is all about the data you can put in it. That’s why DashThis is connected to the most popular digital marketing tools you’re already using in your day-to-day! Creating your digital marketing report shouldn’t be a pain. That’s why we’re here - because we’ve been there. Our system has been created for marketers… by a bunch of marketers! Thanks to our super easy-to-use and powerful tool and our world-renowned account managers here to help every step of the way, over 800 agencies from around the world have fallen in love with DashThis! Maybe you’ve just got a few digital marketing reports to create and you need each of them to be highly customized. Maybe instead you have hundreds to create for different clients, and need similar layouts but different data. Whether you want to customize your widgets, clone reports, work from a template, or create a report from scratch, our tool will take care of it! Think about how much time, and as a result, money, it takes you to create your digital marketing reports every month. Imagine if you could spend that time strategizing, implementing new techniques, and creating value for your brand and your clients instead? With DashThis simplifying and speeding up your reporting process, you can now focus on optimizing your entire business. Because it’s all about the bottom line! Create a report with a custom, white label design that reflects your brand's colours, fonts, and overall vibe. Save on a custom URL and design with a white label bundle that includes both! Marketing reports just the way you want! 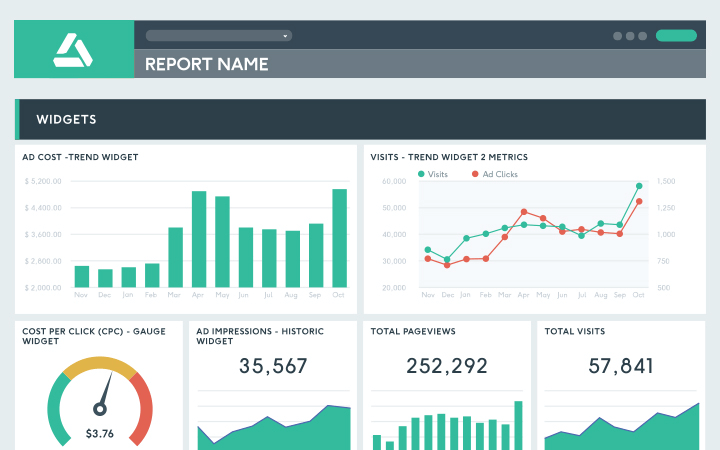 Read our blog to learn more about digital marketing reports!